I have come to the end of the second transcontinental train trip produced by the nonprofit Millennial Trains Project (MTP), having just returned home to Washington, DC after sharing the final two days with the group in New York City, the journey's endpoint. MTP is an endeavor founded on the idea that people can change the world through intentional, shared experiences of travel, and that trains can carry and spread ideas as easily as they can grain or lumber, and with the intent of restoring faith in America's future. MTP seeks to unlock the creative potential inherent in the atmosphere that train travel creates: trains are slow enough to give passengers time to think and reflect and carry on extended conversations, yet fast enough to give one a sense of a whole continent as the sum of its landscapes and communities within the span of a few days. In many ways, the spirit of MTP is a perfect match for my generation's overall attitude, which a recent New York Times profile describes as inventive, introspective, improvisational, skeptical of institutions, and focused on community and good citizenship. One of the five Pioneer's Journey reflection and discussion groups converses aboard the Silver Splendor dome car, traveling between Buffalo and Rochester behind Amtrak's eastbound Lake Shore Limited. Photo by Malcolm Kenton. The stated theme of the journey was to begin a dialogue around defining the new American Dream. At the group's final gathering on Sunday morning at the Hudson Common restaurant inside the Hudson New York Hotel, where the group spent the final two nights, participants shared how the experience changed their lives and their perceptions of what's possible. MTP founder Patrick Dowd asked each participant to reflect on what personal story came from his or her journey and on how the common story of their journey together will be told. Two participants, Jenny Gottstein and Brandi Harvey, said that the journey itself was that new dream put into practice, in that it brought people together in a structured, exploratory environment, building bridges between them. Ayla Boyle commented that Millennials are redefining success as the establishment of community, beyond simply making money. Kyle Studstill, who is producing a mini-video series about innovative, vision-driven small businesses, noted that Millennials are expressing ourselves through the businesses, organizations, events, and movements we start: endeavors that take three or more years to do, but bring others along on some type of journey. He said he discovered how each city MTP visited formed its small business identity, and noted "You see the world in an new way, reflecting on it through train windows." Participant Sarah Smith, whose project focuses on how our food system is changing, spoke of how being together in a confined space over a period of time really bonds people -- even at the microbial level, as the community of microscopic organisms living on and inside us changes to reflect our surroundings. Sarah Al-Khayyal, a practitioner of "tactical urbanism," said she had never experienced such a strong and deep community of people, and observed that "innovation and growth is about getting the right people in a room together," but not forcing a particular outcome. Phoenix Ruach-Shaddai spoke of the journey as an opportunity to develop one's emotional intelligence, as opposed to mental intelligence, because "if you can't connect with others, it doesn't matter what one plus one is, because your math is always going to be wrong." She said she appreciated how the train gave participants -- in close quarters and largely without cellphone or Internet service -- a chance to have some playtime together, as playing is the essence of creativity. "I now know why people say railroads built America," said Fulbright student Ammar Mohammed of Yemen, a country which lacks railroads. "They are a significant communication infrastructure." Fellow Fulbrighter Anser Shaukat of Pakistan said he saw more stars while riding across North Dakota than he had ever seen, and compared this to the way that the journey allowed each individual's star to be seen as part of a much brighter constellation. Abi Widita, a city planning student from Indonesia, said the journey inspired him to explore his own country to see what cities are and are not doing to attract Millennials and incorporate their input in planning. He said Portland, OR came across as a city whose planners understand what Millennials want. A fourth Fulbrighter, Silvia Tijo from Colombia, who is studying sustainable buildings, said she was able to make contact with a broader swath of Americans than she would have otherwise, living in the bubbles of immigrant communities in Miami and Atlanta. She was fascinated by the way that each participant experienced the same place differently--whether that place was one of the cities we stopped in, or the train itself, which allows the breadth of the country to be seen as a single place. It was indeed the first transcontinental railroad that gave Americans the sense of being a united country, rather than an agglomeration of vastly different regions. Anna Marie Smith, who was exploring public high school students' college readiness, said she was inspired to start a podcast and blog series about trains in America, and to work to enable others to use trains as vehicles of discovery. She loved her conversations with Tom Pearson, the owner of one of our sleepers, the ex-Boston & Maine Salisbury Beach and a former employee of Amtrak and a freight railroad. Dowd spoke of the time, as he was formulating and expounding the concept that became MTP, when his mindset shifted from "I'm thinking about doing this trains project," to "I'm putting together a journey." He says changing the way one thinks in this manner changes what one says, which then effects how one acts. Actions then inspire others and cause them to change the way they think. It is this process, repeated over and over again as an idea spreads through the population, that changes the world. He wants MTP journeys to transport participants from "I" to "We," letting them feel comfortable making something happen on a big scale. Others commented that the example Dowd set by making these journeys happen is a lesson in what can happen when one doesn't shy away from pursuing a crazy dream. Brandi Harvey ended the final gathering with this charge to her fellow Millennials: "We are the doers. Keep doing. That's what changes the world." Millennials, who tend to value rich experiences and access to cultural amenities over material wealth and a quiet life in suburbia, are already turning away from car-dependent lifestyles and moving into cities that grew, and are still growing, around passenger rail networks. Some, like Minnesota's Twin Cities, are rediscovering the value that rail transit generates and sustains, while others, like Chicago and New York, continue to thrive in part because they maintained their expansive transit networks and continue to serve as hubs for intercity trains. But it's more than simply the ease of mobility, the ability to stay digitally connected while traveling, and rail's smaller environmental impact that is calling Millennials to go by train. The very experience that the trip itself offers is unmatched by other travel modes. Trains give their riders the chance to really connect, in an analog way, with the community, both on board the train and in the villages, urban and rural, that surround train stations, as well as with the very contours of land and water as the tracks wind through them. 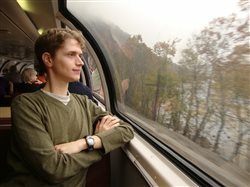 The more that undertakings like MTP inspire people -- Millennials as well as preceding and succeeding generations -- to realize the true value that passenger trains bring as tools for building communities, revitalizing economies, and truly experiencing place on a grand scale, the more a bright future for these vehicles of promise -- long-distance trains in particular -- is assured. One final note: In addition to participants' crowdfunding and sponsorships, the Millennial Trains Project relies on the support of individuals who want young adults to continue to have the opportunity to grow as leaders while exploring America's new frontiers by train. Those who feel so inclined may contribute via this link.